How can Heather best combine sentences 6 and 7 without changing their meanings? The popular local police band, The Blue Badges, coming to play a concert promoting Law Enforcement Week at a school assembly. The popular local police band, The Blue Badges, was coming to a school assembly to promoting Law Enforcement Week, and playing a concert. The popular local police band, The Blue Badges, was promoting Law Enforcement Week and was coming to play a concert and the concert was at a school assembly. The popular local police band, The Blue Badges, was coming to play a concert at a school assembly to promote Law Enforcement Week. In which of the following sentences does Heather use the most vivid, descriptive language? ‘‘This will be a good day,’’ she thought. One was a student sitting at a desk across the room, and the other was an adult who stood near the new student. The quick, fluid hand motions went back and forth between them like some secret code. Which of the following sentences does not belong in Heather’s story? 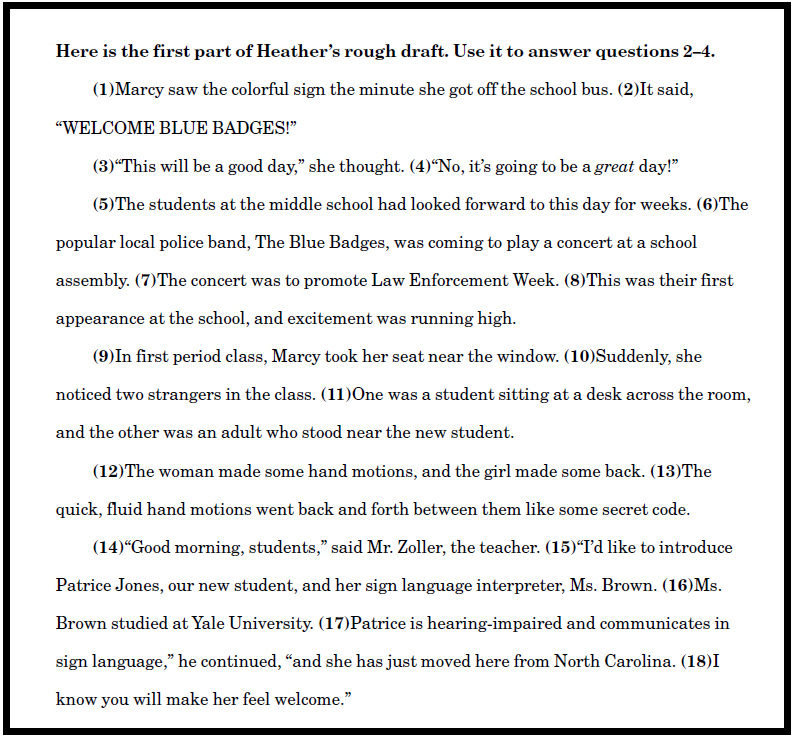 In sentence 19, how is students pored correctly written? 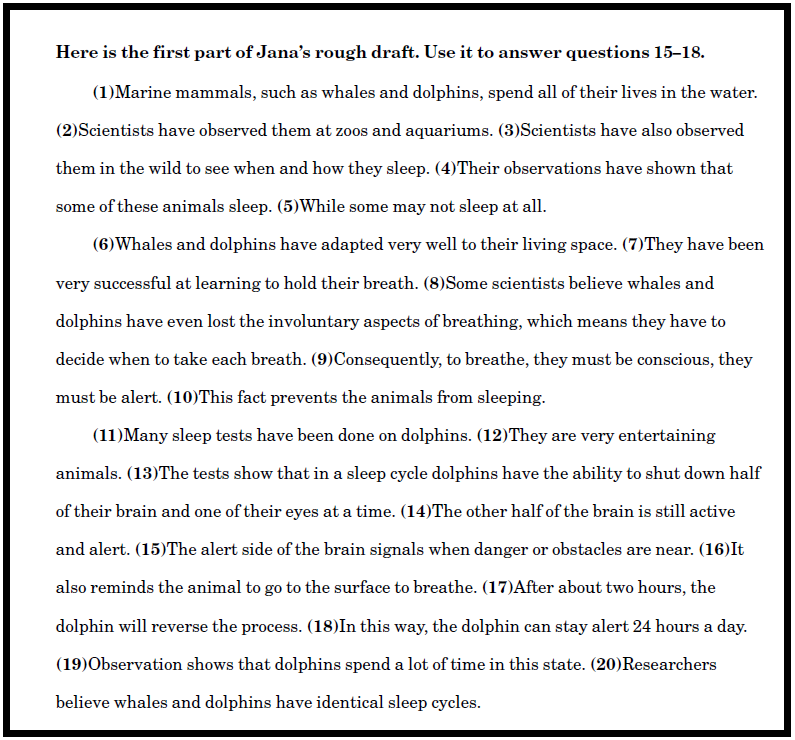 In sentence 21, how is streight correctly written? In sentence 23, how is you’ll correctly written? In sentence 29, how is remembered correctly written? In sentence 30, how is a real quick good-bye correctly written? In sentence 31, how is she thinks, annoyed correctly written? 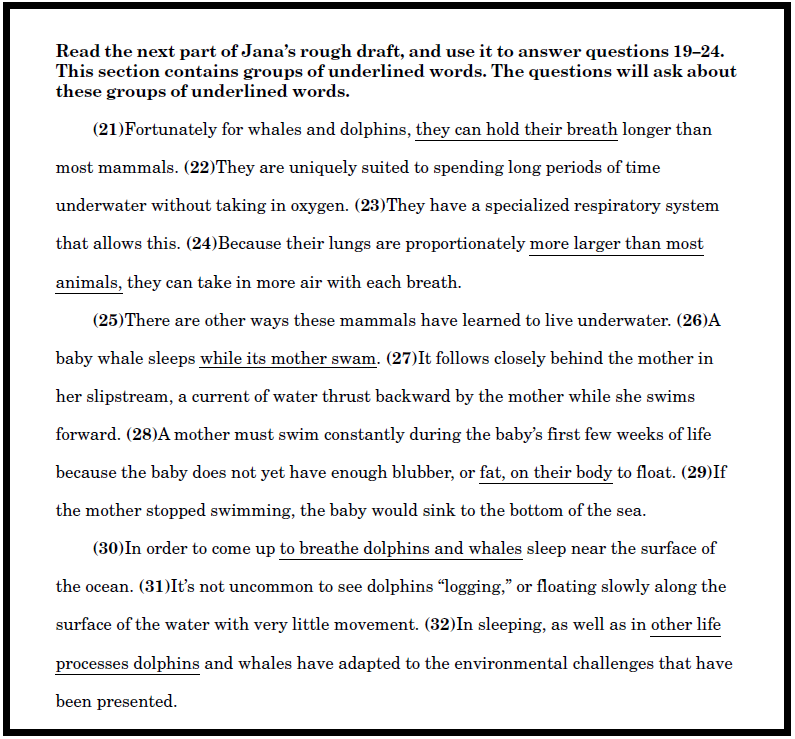 In sentence 32, how is can’t hear none of correctly written? 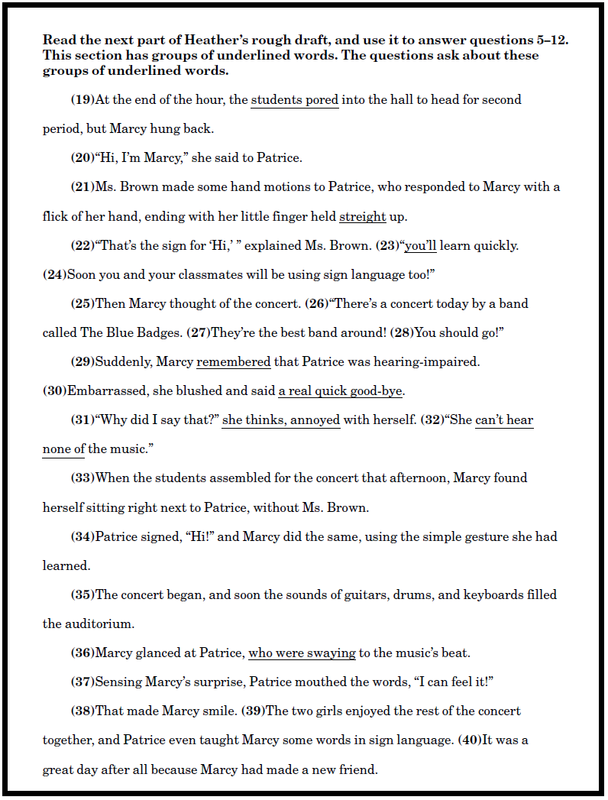 In sentence 36, how is who were swaying correctly written? Jana is considering writing about whales and dolphins. What should she do next? Which of these should Jana do to organize the information she has gathered for her report? What is the best way to combine sentences 2 and 3 without changing their meaning? In zoos and at aquariums they have been observed by scientists and also in the wild to see when and how they sleep. To see how and when they were observed by scientists, they sleep in zoos, at aquariums, and in the wild. Observing them in the wild, scientists observed them to see when and how they sleep in zoos and at aquariums. Scientists have observed them at zoos, at aquariums, and in the wild to see when and how they sleep. Which of these sentences needs to be revised because it is not a complete sentence? What is the best way to rewrite sentence 9? To breathe, consequently, being conscious and alert. Consequently, they must be conscious and alert to breathe. Being conscious, consequently, to breathe and also be alert. Consequently, they must be alert. And conscious to breathe. Which of these sentences does not belong in Jana’s paper?